Magical time at school for Wrexham care home residents | News by Wales Express News, People Before Profit! Care home residents spent a “magical time” being entertained by primary schoolchildren who sang traditional Welsh songs and served afternoon tea. The group from the Pendine Park care organisation in Wrexham were serenaded by the choir at Ysgol Bodhyfryd in Wrexham before being served tea and cake. Pupils chatted to the residents whom they have formed special relationships with, thanks to a pioneering project established between the school and Pendine Park’s Hillbury care home. The youngsters began visiting Hillbury following a suggestion by former teacher Heulwen Harris whose father was a resident there. 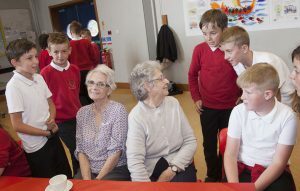 The project went from strength to strength as pupils began weekly visits, taking part in various activities with the residents including music and arts and crafts and bingo sessions. Ysgol Bodhyfryd, Brynycabanau Road, Wrexham enjoy the company of residents from Pendine’s Hillbury Care Home who attended a concert at the school and enjoyed afternoon tea. Pictured :Pupils Josh Hodgson, Harry Richardson, Jack Griffiths, Ryan Williams and Desel Edwards have a good time with residents Heather Davies and Olga Ord. Pendine Park’s relationship with Ysgol Bodhyfryd is one of a series of initiatives organised by the care organisation that aims to bridge the gap between its residents and the local community. Headteacher Geraint Jones, said: “This is a fantastic project and there were quite a few tears at the event at school as our Year 11 pupils were feeling emotional about moving on and not seeing the residents as much, though I’m sure some will keep in touch. 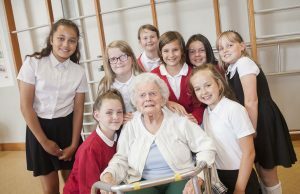 “It has been lovely to see the special bonds that have developed between our pupils and the residents and it has helped to increase the confidence of the children involved. It has also helped our pupils learn about loss as one of our children formed a special relationship with an elderly gentleman who sadly passed away. Pendine Park’s enrichment and activities co-ordinator Lisa Bowring, said: “Our relationship with Ysgol Bodhyfryd is very special and our residents get so much from it. It makes their day when they meet with the children, they really look forward to it.